Ha Noi, 28 September 2016 – Vietnamese universities, Union of Libraries, Research centers and Information Technology (IT) corporations and the Vietnam Foundation developed recommendations for the Government, related ministries and educational institutions on developing OER policy and strategic mechanisms to further promote OER in higher education in Viet Nam. The proposed recommendations were presented by representatives from the University of Social Sciences and Humanities, Vietnam Open Educational Resources (VOER) and the National Center for Research and Development of Open Technologies (RDOT) at the second International Conference on Policy Advocacy on OER development in higher education in Viet Nam. The conference was organized by the University of Social Sciences and Humanitiess under the Vietnam National University Ha Noi with support from UNESCO. OER includes teaching, learning and research materials in any medium that reside in the public domain and have been released under an open license that permits access, use, repurposing, reuse and redistribution by others with no or limited restrictions (Atkins, Brown & Hammond, 2007). UNESCO advocates for OER and encourages decision makers in governments and institutions to invest in the systematic production, adaptation and use of OER and to bring them into the mainstream of higher education in order to improve the quality of curricula and teaching and to reduce learning costs. The recommendations are proposed at a time when the OER Community is in its formative phase. OER stakeholders at the conference voiced their support to the OER movement in Viet Nam and the need for political will from the highest level of the Government and active response from the grassroots levels. 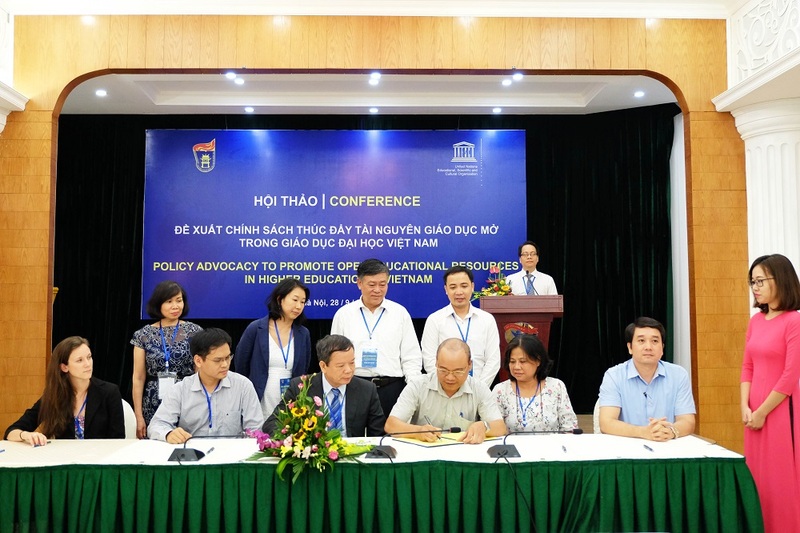 Representatives of 26 organizations included educational institutions, research centers, library associations and IT corporations signed the Memorandum of Understanding to promote OER in Viet Nam.